Parul Tandon leads the Knowledge Management team at MSC. In this role, she oversees the marketing, editorial and design functions and works with teams across Asia and Africa. Her focus is to build thought leadership and strengthen global footprint for MSC. 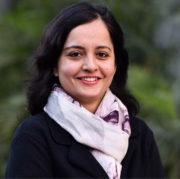 Parul has over 16 years of experience and a significant expertise in Knowledge Management- synthesis and dissemination, Marketing and Communication- strategy and implementation, B2B and Digital Marketing, Content & Design Innovation, IT & KM Integration for Business Efficiency, Team Management, Brand Services Management, etc. Before joining MSC, she worked with Saatchi & Saatchi, Mumbai as an Associate Planning Director where she was responsible for strategic planning on current accounts and new business pitches. Strategy development through market analysis and consumer research was her prime role. Her other responsibilities included client presentation, liaison with the creative teams to plan and implement 360-degree campaigns. She is fluent in Hindi and English. She holds a Post Graduate Diploma in Management from Goa Institute of Management with a specialization in marketing.